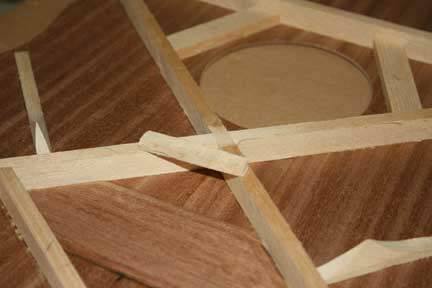 This is How to Make an Acoustic Guitar – Part Five – Carving the Top Braces. 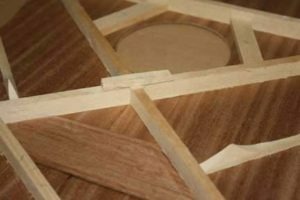 In this post you will see the process of carving the braces, and also learn a few secrets along the way. It starts with the x-brace cap, and then tips on carving the individual braces. Enjoy. After all the braces have been glued in place, it’s time to carve the guitar top. 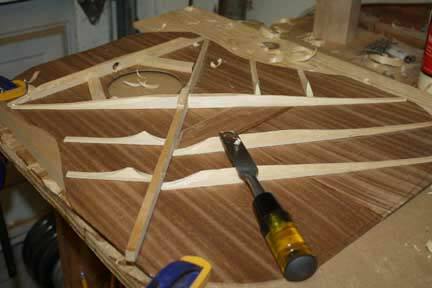 Actually, it’s time to carve the internal braces on the guitar top that will give it the strength to resist the strings and the flexibility to make beautiful sound. Carving your braces is a balancing act between stability and sound. The stronger the bracing structure, the stronger the top, and the better the structure. This is great for keeping your guitar from falling apart, but it’s not very good for making sound. In contrast, a very weekly braced top can vibrate extraordinarily well and make quite a bit of sound. It’s great for music and tone, but it’s very poor for structure. You do want your guitar sound good of course, so there needs to be a happy medium between the two extremes. 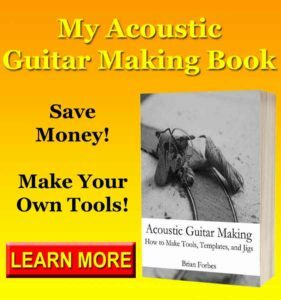 This is a part of making an acoustic guitar that will both challenge and delight you for the rest of your guitar making career. Carving the braces is a balance of form and function, and the more you do it, the more you will learn. Starting with the X-brace, there is one important fact that you need to know about the overall structure of this brace. Its main purpose is to support nearly the entire soundboard with just two little wooden sticks. This is a big job for this one brace. For that reason, it’s important that you do everything you can to make that braces strong as possible, which will mean a longer-lasting guitar. Capping the X-brace is one way of doing that, and it solves the inherent weakness in the way the X-brace is created. 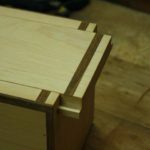 The lap joint itself creates the problem. In both braces, half of the material has been removed from the middle in order to create the X shape. This means that both braces are now weakened by a factor of half, and that needs to be addressed. The easiest way to do this is to cap the brace. This is just a tiny piece of wood that is the same species as your internal braces, and glued to the top of the joint. This restores some of the missing wood, and helps the X-brace perform better. Thankfully, you already have all the materials that you need in order to add an x-brace cap to the center joint. You already have the excess bracing material, so all you need to do is follow the next section and install the cap. The easiest way to strengthen the x-brace is through adding a small piece of wood that is the same species as your internal braces. Cut a piece is the same with as your brace, and about an inch and a half long. Make the height a little over 1/4 inch. Bring this piece over to the X brace and lay it over the top. It’s important that the piece of wood cross over the two saw cuts and not over the solid piece of wood. One of your braces is notched with the notch facing up, this is the one that needs the cap. Prepare a little bit of wood glue, and clamp the piece to the top of the x-brace. Allow this joint several hours to cure, or even better allow it overnight. This is an important joint, and you are going to put a lot of stress on this area during the carve. If you go too fast, you can end up ripping the brace right off. 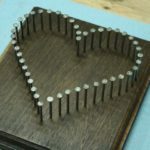 This is easy enough to fix, but it’s a waste of time, and all you need to do is be patient and wait for that glue to dry. The cap is going to make a big difference in your x-brace, so give it the time it needs to dry before moving forward. In most cases, the soundboard has a slight arch to it that is part of the design, which unfortunately makes it difficult to carve. The last thing you want to do is clamp down the entire top, because this can cause damage by flattening the surface. The easiest way to get your soundboard ready for carving is to only clamp down one half of the board at a time. The way to do this is to go left and right across the center line of the book match, or top and bottom depending on where your carving at the time. The benefit of doing this is that it also localizes the section of soundboard that you’re working on, forcing you to complete one section of time. This is actually a good thing, because it builds momentum, and you get to see different parts get finished as you go. Use a support board on your workbench, unless your workbench is already very smooth without any dings or nicks. Spruce is a very soft material, so you want to make sure that the surface you clamp to doesn’t have any particles or debris that can dent the soft wood. The first thing you need to do is wipe off the area completely, and remove any debris. Then, use a set of small clamps to hold down the outside edge of the soundboard. This will result in the other half going up into the air, but that’s okay. 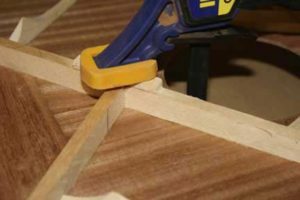 Clamp the board in such a way that you can carve towards the clamps. You don’t want to carve towards the part that’s in the air, because it could flex the soundboard and cause damage. Instead, carve downwards towards the clamps. 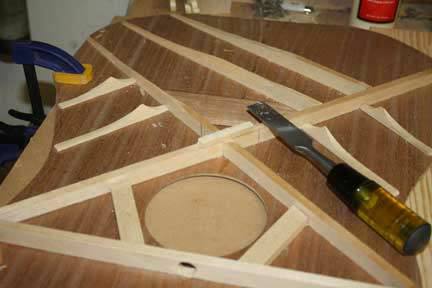 Make sure that you take the time to stop and rotate the soundboard as you carve different areas of the top. 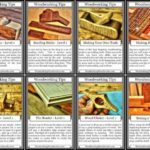 It only takes a few seconds to move the board, and it can prevent damage. This is a very small time investment, but it will make a big difference in the quality of the soundboard. I’m convinced that the number one reason people don’t like to use chisels is that they don’t fully understand how to sharpen them. A poorly sharpened chisel is horrible to work with, and can make you feel like you’re a poor woodworker. This happens when you take a chisel home from the store. The chisel from the store will have an okay edge to it, and if you’re not used to a very sharp edge it can seem like the tool works just fine. It actually doesn’t, but it’s going to do something even worse in a couple hours. As you work along with the chisel, it’s going to slowly become more dull. You won’t really notice it or be able to see it, but all the sudden you will feel like it’s getting harder to use. Not knowing a lot about sharpening, you can attribute this to your own skill level. It’s very odd to work with something and get worse at it instead of better. This can play with your mind psychologically, because after all how is it that after a couple hours of carving you’re actually worse at it than you were when you started? The problem isn’t you, it’s just lack of knowledge. That chisel is getting dull, which means it’s harder to push the wood, it takes bigger chunks out accidentally, and it frustrates the heck out of you while you’re trying to learn. Instead of going through this process, just buy a nice water stone. These are not expensive, and you can find a combination stone with a sharpening and a honing grit all in one package. Look for something with 800 grit on one side and about 4000 grit on the other. This is the combination whetstone that I use, and you can get it on Amazon. This is the perfect stone for sharpening, because the 800 can restore your edge, and the 4000 can turn it into a razor blade. You will be extremely impressed the first time you use a sharp chisel, and you will never use a dull chisel again. I promise. Finally, whenever you feel like your chisel isn’t quite working as well or things seem a little frustrating, stop and hone the edge. A few dozen strokes on the 4000 grit side of the water stone will make a big difference, and the little break will help you clear your head before going back. Once the x-brace joint is fully dried, and the capped area has cured, it’s time to blend this new piece of wood into the braces. This is a pretty straightforward process, and all you need is a very sharp chisel in order to get started. Hold your chisel with the bevel facing down. This is contrary to how a lot of chisels are operated, but stick with me and you’ll understand. With the bevel facing down, you can get into the harder to reach places without the handle getting in the way. You can also tip the handle of the chisel downward and carve a curved shape into the ends of the braces much more easily. It almost allows you to use the chisel more like a gouge, which does take a pinch of practice, but since you are new you might as well learn the whole thing. Start on the sides and the ends of the capped brace, and blend them down into the rest of the X-brace smoothly. The secret to working with the chisel is to take thin passes, and don’t try to dig out the entire thing in one shot. Carefully pare away at the cap and blend it down into the legs of the X-brace. Take a little time, make sure this looks good, and taper the front and back ends into the brace. It’s all about a smooth transition, so don’t leave this step until it looks right. 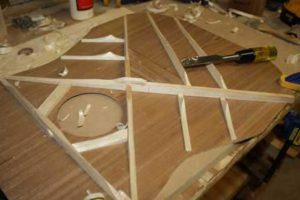 Before carving all of the other braces, it’s important to understand how the shape of the braces affects the tone, and the weight of the soundboard. 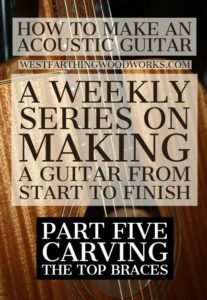 There are are a lot of different schools of thought on carving the braces, but one of the most common is to use a parabolic shape. 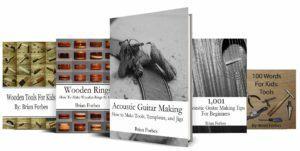 The parabola is one of the strongest shapes in nature, and you can use this to your advantage while you are creating a pleasing sound and structure on your guitar braces. 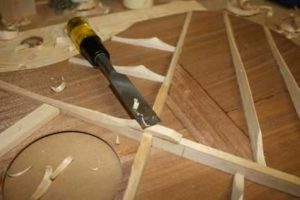 Instead of carving the top of the brace flat, or carving the brace to a triangle shape, carve into a parabolic shape instead. Think of a parabola as a V shape but the legs of the V are bent to be curved rather than straight. The benefit of this kind of carving is that you preserve the height of the brace while removing material and subsequently dead weight from the sides of the brace. If you carve the majority of your braces like this, you will end up with a structure that is strong, it is also very light. This is one of the secrets to making a responsive guitar top. You want a structure that is strong enough but you also want something light enough that it can vibrate well. Let’s pause for a quick physics lesson. As you’re carving your braces, essentially what you’re doing is you are weakening the overall strength of the top. This is intentional, and weakening shouldn’t seem like a bad word in this context. The point of making the top weaker is that it will vibrate better. So, understanding how the size of the brace works in comparison to how much strength or weakness it contributes to the top is an important thing to know. The quick version is that taller braces are going to provide much more structure and strength than shorter braces, assuming there the same with in the same material. In contrast, shorter braces of the same with and material provide less structure. Wider braces in general are heavier, and require more material in order to provide the same amount of structure and resistance as taller braces. In fact, you would need to make a brace several times as wide as a taller brace in order to balance the structure and resistance. Since you also understand that the weight of the top has a strong effect on how well it can move and vibrate, it makes perfect sense that taller and narrower braces are better than shorter and wider braces for the same purpose and material. That being said, as you start to design your own bracing patterns and strategy, think about using narrower braces that are taller. Not only will you get a much stronger structure, it will also weigh a lot less, and subsequently vibrate quite a bit more. Depending on where you remove material from the braces, it can have a different effect on the tone and the structure of the top. This is something that you can use to your advantage, and you just need to understand the difference. When you remove material from the tops of the braces, it lowers the height. From the previous section you understand that the height is directly tied to the strength, so when you remove material from the top of the braces you greatly weaken the brace. If that’s what you’re going for, because you need to loosen up the top, then you are doing the right thing. However, if you go too far you can greatly reduce the effectiveness of the brace, and the overall strength a lot more quickly than you might imagine. If you are trying to lower the tone of your top rapidly, then remove material from the tops of the braces and tap the board to hear the changes. I recommend taking off small sections, because again removing material from the tops of the braces makes a big difference. The alternative to removing material from the tops of the braces is to remove material from the sides, which is slightly different effect. Material removed from the sides of the braces lowers the tone, but not nearly as dramatically as the top. Typically, the material on the sides of the braces is dead weight, and the more that you can remove the lighter it will make your top. Obviously there’s an upper limit, so don’t go nuts, but you can remove quite a bit before you get into the danger zone. If you are trying to remove unnecessary material, the size of the braces is a good place to start. You will notice your tap tone drop very slowly as you remove side material, because again the height is going to be the biggest factor in the strength. 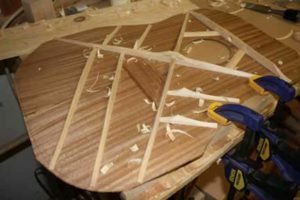 When you carve the upper face brace, simply carve a parabolic shape into the profile, and then scoop both ends down towards the outside edges of the soundboard. This is also called a scallop, and is a graceful curve towards the outside of the soundboard. Your chisel bevel is your best friend when it comes to this part of the operation, so make sure to use it facing down. Take off small chunks at a time, and as you get near the bottom you can press the handle of your chiseled downwards and help create a curved cut. Do this on both sides of the upper face brace, and be sure to move your clamps around as needed in order to prevent flexing the board. This brace can be left a little oversize, and it’s common to see larger upper face braces. 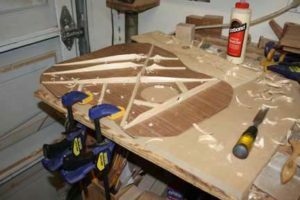 The x-brace provides structure for pretty much the entire soundboard, so it’s important to carve this according to the plans with the book that you’re following. Typically books and plans will give you a size and a profile to shoot for. Do your best to make sure to follow these guidelines so that way you don’t overly weaken these braces, and subsequently the entire soundboard. As a general rule, the brace should taper from full height at the joint to very thin at the tips. Don’t go downhill too fast, otherwise you can create weak points that are difficult to brace out with the rest of the bracing structure. Pay attention to creating a parabolic shape as well, and it will help you remove unnecessary material while maintaining strength. 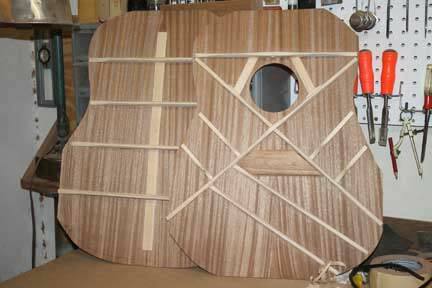 The lower face braces are an important part of the structure of the belly of your acoustic guitar, and the carve is important. Again, if you’re following a plan make sure that you do that. If not, then carefully tap your top while you are removing material to see the sound difference. On most of my guitars, I like to remove quite a bit of material from these braces in order to open up the belly of the instrument. It’s nice to have a guitar and is very responsive, so removing a little of this material makes a big difference in the tone. You can start high on the ends that are attached to the X-brace and then gradually slope downward towards the tips. Or, you can scallop both ends, and remove material from the middle creating a U shape. Either way, make sure to remove excess from the sides to reduce the weight. 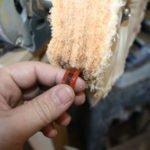 Once you’re done carving braces, and are happy with the job, it’s time to go back with some sandpaper and smooth them all out. Even though it’s very difficult to see inside of the guitar when it’s finished, sanding and final touches are still important. Someday, a guitar repair person may go inside of your handcrafted instrument to address a problem or make a repair. You don’t want that person to go in there and find shoddy chisel work, and no attention paid to the details. The details are very important, and it’s a point of pride to know in your heart that your internal braces are as beautiful as if they were on the outside of the guitar. Use 150 grit sandpaper to power through this process. Make sure as your sanding that you don’t nick the soundboard. Inevitably this will create cross grain scratches that are difficult to remove, and ugly to look at. The point is to make the braces look better, and not make the top look worse. Carefully send all the braces on the sides and the tops until they are very smooth. Then, blow off all sanding dust and look them over to make sure you got everything. If there any areas that still need help, address them before moving on. 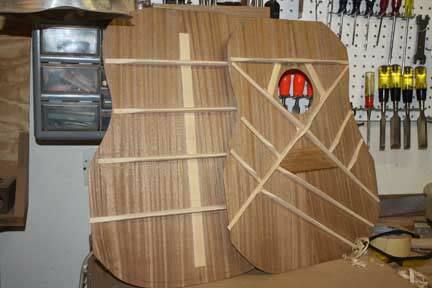 That’s been carving the internal braces on the acoustic guitar, and I hope you enjoyed being along for the process. Carving the braces is actually a lot easier than it looks, and you can benefit by doing a little practice before you get started. The way to do that is to glue a brace to a 2 x 4, and then clamp the 2 x 4 in a vice to hold it all still. Once the glue is dry, break out your chisel and carve that brace just like it was a brace on the inside of your acoustic guitar. Take your time, and pretend that your guitar top is really on the line. Work on carving your scallops, reducing the height, and creating a parabolic shape. Take a very thin passes, and sneak up on your final size rather than trying to jump to it in one shot. Once you are done with your first brace, glue down a couple more and repeat the process. Keep on carving these braces on a scrap 2 x 4 until you’re confident in the process. Then, you’ll be ready to go to your guitar into the real thing. Next week on the how to make an acoustic guitar series all show you how to prepare the braces for the back plate of the acoustic guitar. These are little bit different then preparing the braces for the top, and in many ways a lot easier. The biggest hurdle is cutting and installing them, and working on the center seam reinforcement that goes in between all the braces. 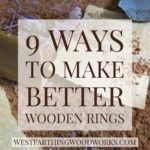 It’s important to get these joints really tight, and there’s a couple secrets along the way that help make the process a lot easier. 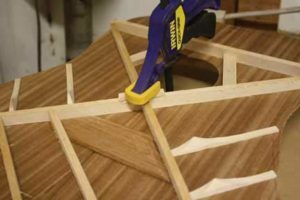 Arching the back braces is also a little different if you are new at it, but again it’s a pretty easy process especially with a couple of hints and tips. You can create a very nicely arched back profile on your guitar without a lot of effort. 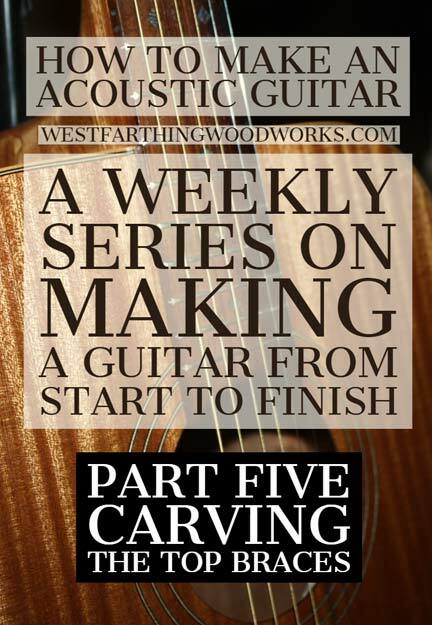 Don’t miss the post next week, it’s going to be filled with a lot of actionable tips and tricks on guitar making. Happy building.